If you've never had a chance to see a whole smoked hog, this whole hog has been butterflied. 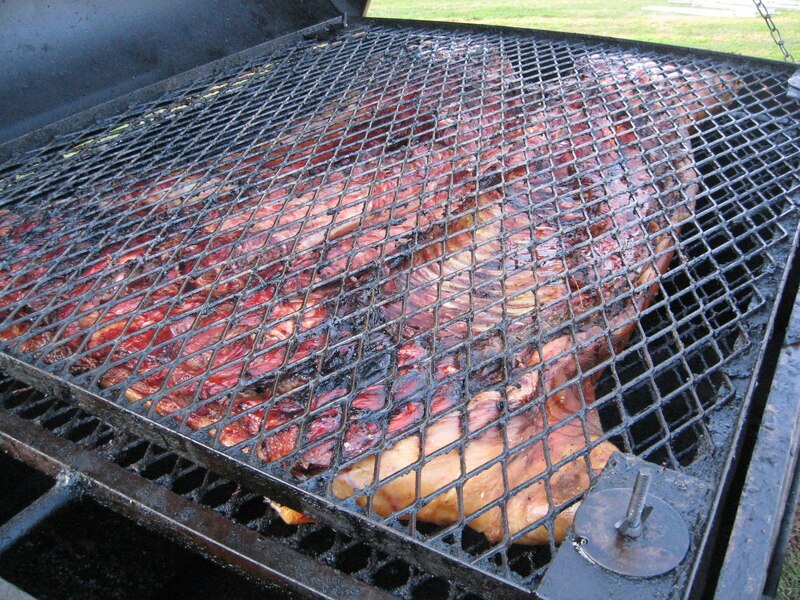 That just means that the pig has been spread across the grate for quicker and more even barbecue smoking. I'm in the Piedmont of North Carolina where we more often smoke pork shoulders or Boston butts, but folks around here (especially in the country) often do full smoked pigs and often on homemade barbecue smokers, since it takes a really big smoker to do a whole hog. This smoker is a little unusual in that it has the grate that flips, so there's not need to try to lift and turn the barbecue pig. 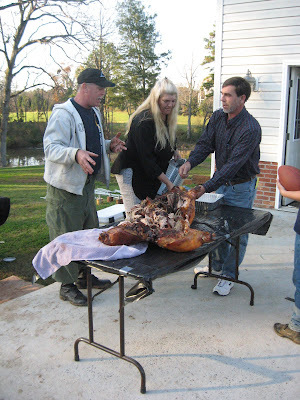 In the eastern part of North Carlina you can see and eat more whole hog barbecue as that's the popular style there. 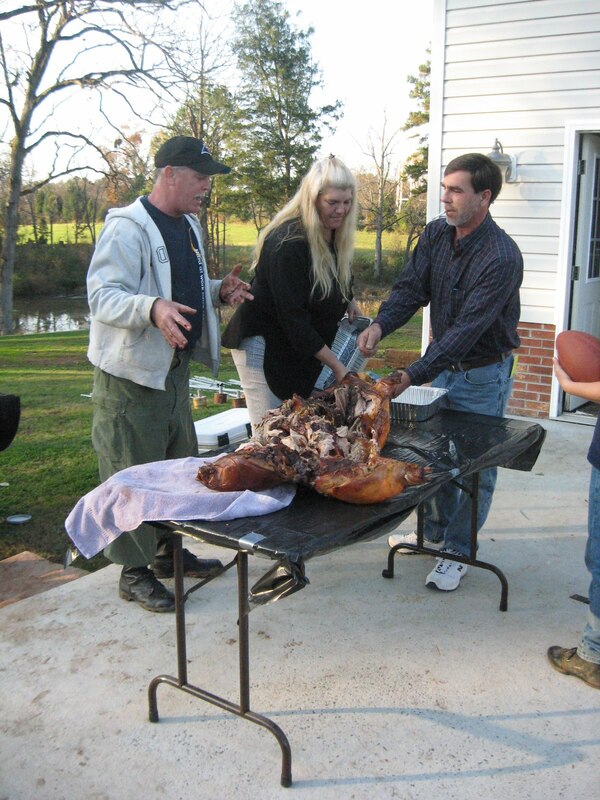 Whole hog means that you get a mix of meat rather than just shoulder. This barbecue whole hog was just pulled off the bbq smoker after resting and cooling a bit. Whole hogs are hot, of course, when they come off the smoker. So, it's a bit of a challenge to get one over to a chopping table. But . . . well worth the effort. Then, you wait a bit or get some chopping gloves (good ones) and either pull the pig meat (pickin as we say here with smoker chefs and guests doing samples off and on). The barbecue gurus are all ready to start picking the pig here. It's a messy job, but it doesn't take as long as you might expect. The meat is so tender and moist that it just falls right off. Or, that's the way the barbecue is when it's done right, and these pigs were primo. 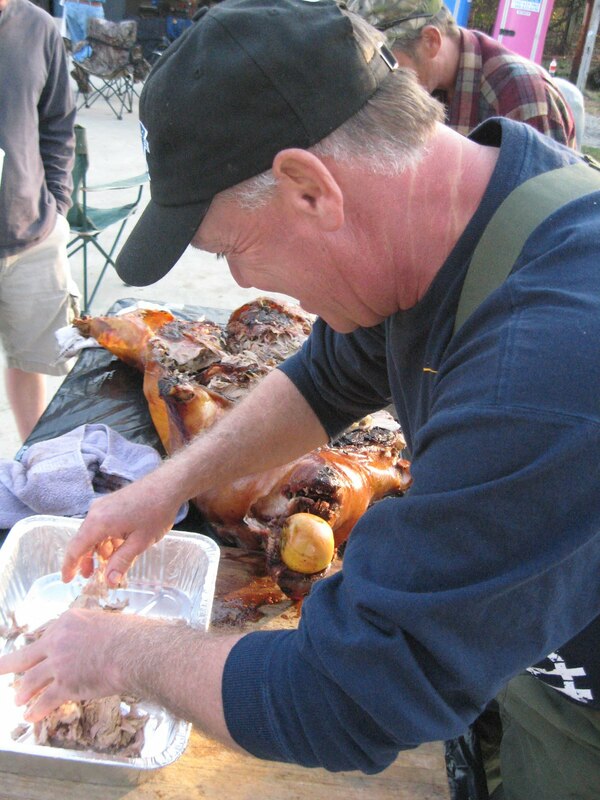 The pickin' begins, and the barbecue guys have this pig picked clean in no time at all. Helpers ran the meat into the garage where everything was set up for one heap good barbecue meal. 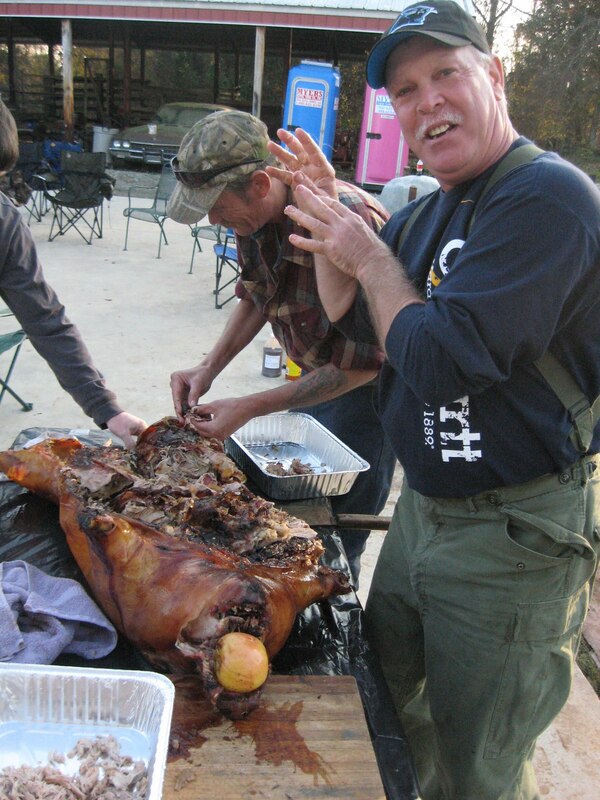 Right before I left the pig pickin', one of the guys asked me if I'd like a slice of the apple that had baked along in the pig's mouth. Well sure. I'd never had pig baked apple, so I was game. 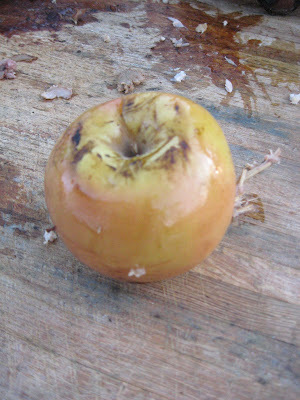 I wasn't sure what it was going to taste like, but I must say I've never had a tastier apple. It picks up some of the sweet pig flavor as well as the smoke. Maybe we need to stuff more apples in there next time. It really was yummy. WOW! Awesome, I haven't done anything like that in a long time. Gotta kick up your heels now and then. And what better way than at a pig pickin'! Yum.